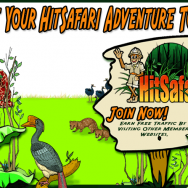 Treasure Hunting Traffic is honored to be invited to another Super Saturday with High-Hits, HitsBooster Pro, and Hit Safari. During Super Saturday each exchange gives away a $25 prize. Just surf 300 sites at one, two, three or for the best chance of winning, all four traffic exchanges to automatically be entered into the draw. For every 100 sites you surf over 300, at each site, you get an extra entry. MAKE SURE that you have listed your PayPal email in your profile in case you are the winner.